Sudden Cardiac Death and Anomalous, Aortic Origin, Coronary Arteries. Gawthorn Cardiovascular MRI Fellow, Royal Devon and Exeter Hospital, Exeter. Coronary artery anomalies (CAA) are the second most common cause of exercise related deaths in competitive athletes accounting for 17%1, with SCD the presentation in half of these cases. The true prevalence is unknown with data from retrospective angiographic or autopsy studies. There is significant uncertainty about which phenotypes are malignant, which can be discharged, require follow up or corrective intervention and how they should be investigated. Here we discuss the state of the art and the future directions. Coronary artery anomalies are defined as variations in coronary anatomy present in less than 1% of the population2. The true incidence is unknown- with retrospective invasive angiographic studies suggesting an incidence of 0.3-5.6% and autopsy studies quoting 1%- both prone to referral bias3. 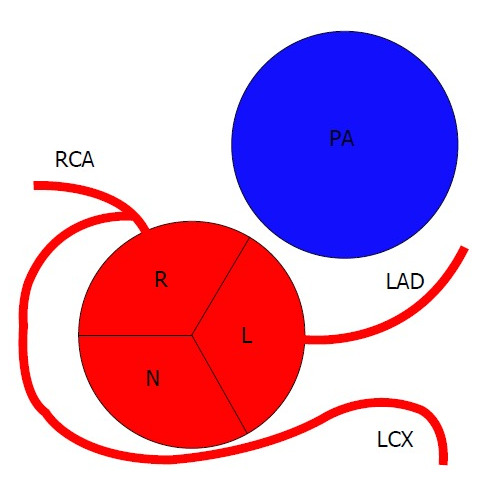 On the basis of the <1% definition variations in coronary artery anatomy such as, left coronary dominance (posterior descending artery [PDA] and posterolateral branches [PLB] from left circumflex [LCx], incidence 8%), co-dominance (PDA and PLB from both LCx and right coronary artery [RCA], incidence 2.5%), Ramus intermedius (trifurcation of LMS) and separate ostium of conus branch (incidence 1.2%) are all normal variants. Coronary anomalies arising from the PA are exceptionally rare (0.0008-0.008%) 3 and have associations with SCD but usually have structural abnormalities such as regional wall abnormalities or aortic abnormalities. For this reason this group is not covered here. A challenging group are those people who present incidentally, with structurally normal hearts and/or with non-specific symptoms. These are very likely to be encountered by a general cardiologist and it may be very difficult to attribute or rule out the coronary artery anomaly as the cause of symptoms. The topic is of importance given the likely increased discovery rate with the new role of cardiac CT angiography in investigation of chest pain and, despite a low incidence of these anomalies, they are significantly overrepresented in cases of sudden cardiac death in the young with the profile raised further by SCD cases in competitive athletes. The aims, therefore, of this article are to summarise the known malignant anomalies, the factors with unknown risks and consensus recommendations. Anatomical classification aims to describe the origin, the ostium and finally the course (see figure 1). The nomenclature described here is adapted from Angelini2. In normality the coronary anatomy consists of 2-4 ostia with arteries arising from the right and left sinuses of Valsalva at an orientation of 45-90deg from the aortic wall2. The different descriptive terms used are summarised in Table 1. Reproduced with permission from McLarry et al. Copyright ©The Author(s) 2015. Published by SpringerLink Publishing Group Inc. All rights reserved. Figure 116: Normal coronary artery origin and course contrasted with several varieties of AAOCA. a Normal coronary artery origin and course. b Anomalous origin of the LCX from the RCA with a posterior (retroaortic) course; this is more commonly encountered than AAOCA of the LCX from the right sinus of Valsalva. c AAOCA of the LM with an anterior (prepulmonic) course. d AAOCA of the LM with a posterior (retroaortic) course. e AAOCA of the LM with a subpulmonic (intramyocardial) course. f AAOCA of the LM with an interarterial course. g AAOCA of the RCA with an interarterial course. LCX left circumflex coronary artery, RCA right coronary artery, LAD left anterior descending artery. On the basis of anatomical patterns associated with exercise related SCD involving Anomalous, Aortic origin, coronary arteries (AAOCA), reports in the medical literature highlight the association of slit-like orifice, acute angle take off, interarterial or intramural course4 (see figure 2). The mechanism is thought to involve exceptional ischaemia and malignant arrhythmia from compression of coronary artery between aorta (Ao) and pulmonary artery (PA) (interarterial course), ostial occlusion during exertion (slit-like orifice and acute angle take off) or proximal segment occlusion (intramural course in the aortic wall). In the case of SCD at rest it is postulated that chronic ischaemia and fibrosis in the territory supplied gives rise to malignant arrhythmia2. Reproduced with permission from McLarry et al Copyright ©The Author(s) 2015. Published by SpringerLink Publishing Group Inc. All rights reserved. The commonest anomalies are separate left anterior descending artery (LAD) and left circumflex (LCx) ostia (0.67%) from the left sinus of Valsalva (LSV) and LCX arising from the right coronary artery (RCA) or right sinus of Valsalva (RSV) (0.67%)5. A single case report of SCD in the medical literature has been associated with separate LAD and LCx ostia6. The case was a 24 year old man with failed resuscitation after being found collapsed in a swimming pool at a party with significant alcohol levels on a toxicology report. The case was interesting in that the LAD took an unusual interarterial course. There were areas of fibrosis in the anterior wall suggestive of chronic ischaemia giving rise to arrhythmia. All published cases of LCx from RSV or as a branch of the RCA describe the circumflex artery taking a retroaortic course (see figure 3) with no cases of SCD found on literature search for this article. Figure 3: Schematic representation of left circumflex artery arising from right coronary artery3. RCA: Right coronary artery; LAD: Left anterior descending; LCX: Left circumflex; R: Right sinus of Valsalva; L: Left sinus of Valsalva; N: Non-coronary sinus; PA: pulmonary artery. Anomalous left coronary artery from the right sinus of Valsalva (ALCA-R) includes an ectopic LMS from the RSV (ostium separate from RCA ostium), confluent ostia or single coronary artery (single ostium) with an incidence of 0.15%. This is the classically described malignant anomalous coronary artery and is the most commonly described AAOCA associated with sudden cardiac death7. Most frequently the left system passes interarterially. SCD is reported at rest and with exercise4. Figure 416: A 55-year-old female presented with exertional syncope. The evaluation culminated in a coronary CTA that demonstrated an anomalous left main coronary artery arising from the right sinus of Valsalva and coursing between the aorta and pulmonary artery. a The three-dimensional volume-rendered image demonstrates the malignant interarterial course of the anomalous left main (arrow) coronary artery between the aorta and pulmonary artery (subtracted to visualize the left main). b The maximum intensity projection image demonstrates the acute angulation, slit-like ostium, and the anomalous course of the left main coronary artery (arrow) between the aorta and pulmonary artery. The interarterial form of AAOCA is associated with an intramural course that leads to coronary intussusception with exertion, luminal compression, critical reduction of flow, and an increased risk for sudden cardiac death. Ao aorta, PA pulmonary artery. Reproduced from McLarry et al Copyright ©The Author(s) 2015. Published by SpringerLink Publishing Group Inc. All rights reserved. Anomalous right coronary artery from the left sinus of Valsalva, ARCA-L, (single coronary artery or separate ostia) is many times more common than ALCA-R yet is significantly less frequently associated with SCD7. The SCD medical literature in this group generally describe high risk anatomical features as being an acute angle take off, intramural or interarterial course4. The medical literature of RCA and LMS from posterior Sinus of Valsalva (PSV) yields one report worldwide. SCD in a 16 year old occurred whilst playing basketball having experienced syncope during exertion 2 weeks prior 8. There was no interarterial course but an acute angle take off of the LMS (<45deg) was reported. 2 documents provide guidance on competitive sport and surgical intervention in AAOCA respectively. The AHA consensus document9 recommends athletes with ARCA-L should be evaluated by exercise stress testing. Return to competitive sport can be considered with a negative stress test after adequate counselling as to risk and benefit, taking into consideration the uncertainty of accuracy of a negative stress test (Class IIa; Level of Evidence C). Symptoms, arrhythmia or ischaemia on exercise stress testing should result in restriction from competitive sport before surgical repair (Class III; Level of Evidence C). Athletes with an ALCA-R, found incidentally or associated with symptoms, should be restricted from participation in all competitive sports before surgical repair (Class III; Level of Evidence B)9. Coronary artery origins and course should be assessed in: aborted SCD or life threatening arrhythmia, unexplained coronary ischaemic symptoms or unexplained LV dysfunction (Class I; Level of Evidence B). Surgical revascularisation should be performed in ALCA-R coursing between Ao and PA or ARCA-L coursing between Ao and PA with evidence of ischaemia (Class I; Level of Evidence B). Functional testing plays an uncertain role in the management of AAOCA. Whilst it is integrated in the above consensus documents, functional testing will not identify exceptional ischaemia- defined as myocardial ischaemia occurring very rarely and without consistency. Furthermore, given the fact that athletes with AAOCA suffering exercise related SCD often train at or at a greater intensity relative to the index event what is the value of a negative stress test? With the recent change by the UK national guidance body- The National Institute for Health and Care Excellence (UK NICE) regarding the management of recent onset chest pain and proposed increased use of computer tomography coronary angiography (CTCA), the significance of finding AAOCA in patients >35 years old without evidence of atherosclerotic lesions is an important unknown particularly as this group has a much lower incidence of SCD4 and much less certain surgical benefit11. What is the long term durability of a bypass graft onto an artery experiencing exceptional ischaemia and therefore competitive flow? Atresia in the RIMA graft to ARCA-L has been reported in several analyses of this technique12. Two surgical series of AAOCA13,11 describe ligation of the anomalous artery after grafting or use of alternative repair operations. However, it should be noted, no positive impact has been demonstrated when comparing long-term surgical outcomes against conservative management11. Furthermore, surgical intervention is not risk free and must be balanced against the unknown natural history of AAOCA on one hand and the psychological impact of living with the potential of SCD on the other14. With the above unknowns the Texas Children’s Heart Center has developed a Coronary Anomalies Program15 aiming to produce a registry of anomalies and an MDT process to manage them by consensus. According to their decision pathway ALCA-R is managed surgically however not by CABG but by unroofing intramural segments, neo-ostium creation, coronary translocation or ostioplasty. All other AAOCA lacking high risk anatomical features or proven ischaemia on functional testing are closely followed up. Of note the programme will only consider surgical intervention in the >35yrs age group on a case by case basis. AAOCA is the second most common cause of sudden cardiac death (SCD) in competitive athletes. The low prevalence of AAOCA, risk of associated SCD and lack of data to guide treatment and lifestyle modification make its management particularly taxing. ALCA-R, symptomatic anomalies with slit-like orifice, intramural or interarterial course should be considered malignant with consideration of surgical management in those less than 35 years of age. Integration of functional testing into a clinically useable algorithm is unproven as is the surgical management in those over 35 years old. In the long term, with the uncertainties in the field, a UK wide registry with standardisation of anatomical description and MDT decision making with involvement of pathologists, cardiologists, surgeons and radiologists may help understand the true prevalence and malignancy of the condition. 1. Maron BJ, Doerer JJ, Haas TS, Tierney DM, Mueller FO. Sudden deaths in young competitive athletes: analysis of 1866 deaths in the United States, 1980-2006. Circulation 2009;119(8):1085–92. 2. Angelini P. Coronary artery anomalies: an entity in search of an identity. Circulation 2007;115(10):1296–305. 3. Villa AD, Sammut E, Nair A, Rajani R, Bonamini R, Chiribiri A. Coronary artery anomalies overview: The normal and the abnormal. World J Radiol 2016;8(6):537–55. 4. Taylor AJ, Rogan KM, Virmani R. Sudden cardiac death associated with isolated congenital coronary artery anomalies. J Am Coll Cardiol 1992;20(3):640–7. 5. Page HL, Engel HJ, Campbell WB, Thomas CS. Anomalous origin of the left circumflex coronary artery. Recognition, angiographic demonstration and clinical significance. Circulation 1974;50(4):768–73. 6. Cittadini F, Oliva A, Arena V, Senati M, Pascali VL. Sudden cardiac death associated with a coronary artery anomaly considered benign. Int J Cardiol 2009;133(1):e39–40. 7. Basso C, Maron BJ, Corrado D, Thiene G. Clinical profile of congenital coronary artery anomalies with origin from the wrong aortic sinus leading to sudden death in young competitive athletes. J Am Coll Cardiol 2000;35(6):1493–501. 8. Catanzaro JN, Makaryus AN, Catanese C. Sudden cardiac death associated with an extremely rare coronary anomaly of the left and right coronary arteries arising exclusively from the posterior (noncoronary) sinus of valsalva. Clin Cardiol 2005;28(11):542–4. 9. Van Hare GF, Ackerman MJ, Evangelista J-AK, et al. Eligibility and Disqualification Recommendations for Competitive Athletes With Cardiovascular Abnormalities: Task Force 4: Congenital Heart Disease: A Scientific Statement From the American Heart Association and American College of Cardiology. Circulation 2015;132(22):e281–91. 10. Warnes CA, Williams RG, Bashore TM, et al. ACC/AHA 2008 guidelines for the management of adults with congenital heart disease: a report of the American College of Cardiology/American Heart Association Task Force on Practice Guidelines (Writing Committee to Develop Guidelines on the Management of Adults With Congenital Heart Disease). Developed in Collaboration With the American Society of Echocardiography, Heart Rhythm Society, International Society for Adult Congenital Heart Disease, Society for Cardiovascular Angiography and Interventions, and Society of Thoracic Surgeons. J Am Coll Cardiol 2008;52(23):e143–263. 11. Krasuski RA, Magyar D, Hart S, et al. Long-term outcome and impact of surgery on adults with coronary arteries originating from the opposite coronary cusp. Circulation 2011;123(2):154–62. 12. Fedoruk LM, Kern JA, Peeler BB, Kron IL. Anomalous origin of the right coronary artery: right internal thoracic artery to right coronary artery bypass is not the answer. J Thorac Cardiovasc Surg 2007;133(2):456–60. 13. Reul RM, Cooley DA, Hallman GL, Reul GJ. Surgical treatment of coronary artery anomalies: report of a 37 1/2-year experience at the Texas Heart Institute. Tex Heart Inst J 2002;29(4):299–307. 14. Phoon CK. Management of anomalous coronary artery. J Am Coll Cardiol 2001;38(4):1269–70; author reply 1270–1. 15. Mery CM, Lawrence SM, Krishnamurthy R, et al. Anomalous aortic origin of a coronary artery: toward a standardized approach. Semin Thorac Cardiovasc Surg 2014;26(2):110–22. 16. McLarry, J., Ferencik, M. & Shapiro, M.D. Curr Cardiovasc Imaging Rep (2015) 8: 23.